Good, Evil And Long Black Tentacles Make A 'Monstress' Gaudy beauty and extravagant horror twine around each other in Marjorie Liu's new graphic novel Monstress. It's the story of a girl caught up in a war of magic in which neither side comes off well. 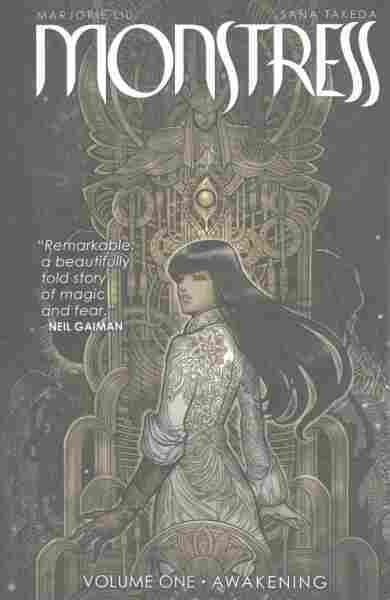 Gaudy beauty and extravagant horror twine around each other, as elegant as their subjects' sinuous hair and garments, in the remarkable comic Monstress. Its lavish visuals, intricate world building and deft pacing will doubtless land it on many "Best of" lists for 2016. But writer Marjorie Liu's nervy, idiosyncratic characterizations are what really set this story apart. First, though, there are those lavish visuals. Artist Sana Takeda has mined contemporary manga, traditional Japanese and Chinese design, ancient Egyptian art and Western art nouveau — plus a fertile bed of steampunk — for iconography and style. She's laminated it all together to create an overwhelming sense of surfeit in each panel. Golden grillwork decorates every surface of the compound where Cumaean "witch-nuns" perform ghastly experiments in a quest for the secrets of life. Intricate patterns are stitched onto the garments of the mysterious Dusk Court and swirl up the sleeves of protagonist Maika's jacket. Takeda is good at making things gleam, and most things do — from the sky above the land of the Arcanics, a race of magical beings who may appear animal or human, to a spot of moisture on Maika's bottom lip. The gleaming world Takeda has drawn isn't just pretty. For one thing, many of its denizens do unspeakable things to each other. But Takeda's art also provides a vital support for Liu's audacious storytelling. Liu isn't just out to create another world, though she does do that. The warring races of Humans and Arcanics, armed with steampunk weapons and magic, are complicated and compelling. The Arcanics are wonderful creatures: There's an adorable little fox child, and the cats are wise and have multiple tails. But a long war has engendered a sense of pessimism amid the magical surroundings. Maika, who has done time in a slave camp and lost part of her arm, is more pessimistic than most. "Here's something the poets say," she reflects: "There's more hunger in the world than love." Liu's accomplishment is impressive. She's created characters who feel larger than life, but whose motivations and values are almost always obscure. This story includes warring tribes and arcane magical cliques, but it's never clear which are the "good guys." Make that "good girls:" Liu has populated her world largely with women. Rather than introducing a matriarchal vibe, this choice just makes everything more uncertain. It certainly upends any sentimental notion of traditional "feminine" virtues. The appalling tortures that provide the one firm moral pole in this story are inflicted by the all-female Cumaeans — with relish. In most myths there's a hero who fights for good. Maika wants to avenge her mother, true, and she's certainly opposed to the abominable Cumaeans. But she's hardly a shining heroine. Deep within her lies a horrible force — a monster, in fact — that erupts from her body in massive black tentacles when she's threatened. She frequently has to fight to control the monster's insatiable appetite, and she doesn't always win. As a result of this unpredictable hunger, she doesn't attract allies so much as provide a least-bad option for them. "I followed you. I thought it would be safer," the fox child says, catching up to her after they've (bloodily) escaped a dungeon. "You're good at killing." Liu's accomplishment is impressive. She's created characters who feel larger than life, but whose motivations and values are almost always obscure. Takeda's artwork is crucial to maintaining Liu's sense of moral uncertainty. Fleshing out ambiguous characters is never easy, and a world full of gray areas can sometimes feel insubstantial. Takeda's rich, busy environments suggest a dense history and mythology for these characters, even if it isn't spelled out in the narrative. Ironically, considering the strength of Liu's characterizations, Takeda's one weak point is her faces. They're beautiful but doll-like. Liu's own weakness is her penchant for grisly horror scenes. They feel rather forced, as if she couldn't think of any better way to make evil tangible than to hack up children's bodies. It's odd, considering how much time she's clearly spent thinking about the subtleties of good and evil; those gradations are most intriguing when they're hinted at and uncovered slowly. If there's one thing Monstress shows, it's that it's what's inside that counts.